As a restaurant critic, I hope my reviews don’t sound like broken records—that I’m not recommending the same dishes at different restaurants. But, over the past year, I can’t remember eating a meal where I wasn’t totally impressed with the veggies. In fact, the best dishes—the most inventive, boldest and yummiest—have been veggie-based, with grains and legumes playing supporting roles, and animal protein being used as a condiment and a curtain of flavor. I have asked chefs about this phenomenon and heard the same response, over and over. These preparations can also transform and lend flavor to what might otherwise taste like, well, a turnip. If you’re reading this and thinking, “I like vegetables, too...on my hamburger,” I’m with you. To feel satisfied, I often add chicken to my veggie bowls. But there is an undeniable creativity going on with plant-based cooking that seems to be attracting meat eaters, too. Even typical restaurants that don’t subscribe to veganism are emphasizing vegetables in new and exciting ways. It’s a trend that seems to go hand in hand with the increased awareness of allergies and sensitivities to foods containing soy, gluten and dairy. The ultimate expression of this trend may be the newest venture from Brunson and Hot Cakes maven Autumn Martin, a plant-based ice cream shop that they’re launching this fall, Frankie and Jo’s (frankieandjos.com). It’s yet another sign of how Seattle is pulsing with a fresh energy for vegetarian, vegan, gluten-free and raw food. What began in Madison Valley in 1991 with Cafe Flora’s beautiful non-meat cuisine paved the way for Chaco Canyon Organic Cafe (multiple locations) in 2004, followed by Plum Bistro on Capitol Hill in 2009. Now, a new wave of restaurants is taking plant-based eating to another level of flavor and complexity. Chefs are borrowing bold spices and ingredients from global cuisines and using ancient and artisanal cooking techniques to elevate quinoa, enliven juicing and make kale salad sing. It’s also about inclusion and accessibility: restaurants with casual settings, where paleos, vegetarians, the gluten-averse and everything-in-moderation folks like me can tuck into a bowl or grab and go. Think of it as whole-foods dining in a fast, casual format. Meg Trainer’s Bounty Kitchen is a great example. Before opening the café in 2015, Trainer spent five years at Whole Foods Market overseeing the prepared-foods team for the Pacific Northwest. During her tenure, she helped launch Health Starts Here, a line of plant-based salad and hot bar items each containing no more than 3 ounces of lean meat or fish and healthy fats from whole food sources, such as avocados. She traveled the country, meeting with doctors and health experts about the benefits of plant-based eating. And she spent a lot of time talking to customers, who told her they longed for a place other than a grocery store where they could up their veggie game. 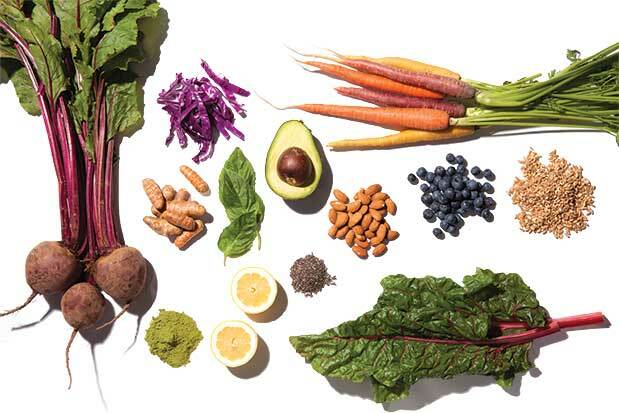 “It feels like we’re going through a health food revolution in Seattle,” Trainer says. “People want to eat healthier now.” Inside her modern café, perky plants line the shelves and community tables bustle with neighborhood regulars. At breakfast, lunch and dinner, Bounty Kitchen serves imaginative dishes, like Rishi Tea masala chai steel-cut oats ($8) with coconut cream, toasted pistachios and seasonal dried fruit, and “great bowls of goodness,” heaping mixes of greens, beans and grains with an emphasis on Asian, Cuban and North African flavors. Middle Eastern ingredients are at the heart of Anar, the sister juice bar and café to Capitol Hill’s Mamnoon. Co-owner Racha Haroun developed the menu, which stars juices blended with aromatic ingredients such as rosewater and orange blossom water, and grain-and-legume dishes free of gluten, processed sugar and dairy, except for plain, unsweetened Ellenos yogurt (found only at Anar and the Ellenos stand in Pike Place Market), a staple at Middle Eastern meals. Flavor is the focus at Jujubeet, which began three years ago as a tiny juice bar in the alley by Top Pot Doughnuts in Bellevue. Today, there are five locations specializing in cold-pressed juices and vegan grab-and-go salads and raw desserts, with a sixth location opening any day now in South Lake Union. Earlier this spring, Jujubeet cofounder and self-described foodie Bianca Szyperski unveiled the first Jujubeet Café, a chic, 1,000-square-foot restaurant where devotees can sit at a dramatic, brushed steel community table to savor a green juice ($7.95–$8.95) or wine produced from sustainably grown grapes with a platter of creamy raw-cashew-based cheeses and pecan mushroom pâté (trust me, it’s like truffle butter; $14). Texture is critical when it comes to vegan versions of sumptuous dishes, and Szyperski and her crew, which includes registered dietician Elena Razmpoosh, nail it every time. Seattle couple and first-time restaurant owners Colleen Kerr and Mike Moon of Sweetgrass Food Co. believe eating a plant-based diet is increasingly part of a Seattle lifestyle, one that coexists with long work days and an insatiable desire for Wi-Fi. “This is how people are living now, with balance and intention,” Kerr says, explaining that if you’re going to work an 18-hour day, as some of her customers in tech do, you have to nourish your body. Couples don’t get more Seattle than Kerr and Moon, who met in 2012 at the Seattle Regional Leadership Meeting, 10 months after Kerr sat in the Wishing Chair (said to bestow good luck on those who sit in it) in Seattle’s Smith Tower. She’s a lawyer for Washington State University, he’s a former business consultant. And their 2,400-square-foot restaurant, which opened last fall in downtown’s Metropolitan Tower Apartments, features an upstairs room for meetings and celebrates their mutual love of global superfoods. Look for a $10 latte loaded with fresh, nutrient-rich Brazil nut milk (a relative bargain if you think about all the nuts that need to be soaked and strained for one latte), and amaranth, a gluten-free grain in their fennel, lemon and kale grits ($7.50). Moon, a former shrimp and grits lover, can’t get enough of the latter. “When you find something that is abundant in both flavor and nutritional content, it’s hard not to go a little overboard,” he says. And perhaps that’s the best way to look at plant-based eating. For many people (including me), it isn’t about absolutes. It’s about eating healthy—and what tastes really good. Breakfast: Juicebox’s white bean and veggie hash with red pepper, kohlrabi, pea vines, fried egg and herbs ($12); Anar’s cardamom coffee with date syrup and hemp milk ($5). This coffee is my jam. Snack: Jujubeet Café’s raw cheese platter ($12) of truffle, basil pesto and cracked pepper cheeses made from cashews, plus pecan mushroom pâté served with Nuflours gluten-free bread. Delectably smooth and savory. Lunch: The Marrakech Market Bowl ($12) at Bounty Kitchen, which includes arugula, mint, couscous, dried currants, apricots, chickpeas, diced sweet potatoes and harissa, among other ingredients; Bounty Spicy Green juice ($6/8 ounces), made with pineapple, cucumber, cilantro and jalapeño. So satisfying. Snack: Sweetgrass Food Co.’s chia pudding ($6), a vanilla cashew conconction with raw pumpkin seeds, sunflower seeds and golden berries. A sweet, super boost of protein in the afternoon. yogurt and pickled turnips, together with Bounty Kitchen’s Spicy Green juice ($6), made with pineapple, cucumber, cilantro and jalapeño. An excellent combo. Dessert: Jujubeet’s chocolate pot ($4), a silky mousse made from cashews, coconut, vanilla, almond milk, raw honey and chocolate, with coconut milk whipped cream. I can’t believe it’s not bad for me.